TEMPE – U.S. diplomats were expelled from Venezuela on Friday, days after members of the Venezuelan community in Arizona rallied to show support for the man they now call Venezuela’s legitimate president, Juan Guaidó. The demonstration echoed a sense of renewed hope for the crisis-stricken South American country. “It feels like this time we are seeing a light in the tunnel,” said Joen Romero Martínez, who moved to Arizona from Venezuela 20 years ago in search of a better life. Martinez was one of more than 50 people who demonstrated near Tempe Town Lake on Wednesday. The march was put together by Casa Venezuela Arizona, an organization that gives Venezuelans a place to come together and share their culture and traditions. According to 2010 Census data 1,707 Venezuelans live in Arizona. The demonstrators proudly displayed the Venezuelan flag on hats, shirts and flags of all sizes as they spoke about Guaidó, 35, leader of Venezuela’s National Assembly. The Assembly has named him interim president, effectively replacing Nicolás Maduro, who has been in power since the death of the previous president, Hugo Chavez, in 2013. On Friday, Maduro tweeted he will fight what he called a political coup orchestrated by the United States. President Donald Trump this week tweeted this week his support for Guaidó, declaring him the interim president and prompting Maduro’s government to sever diplomatic ties with Washington. Venezuela reacted quickly, giving U.S. diplomats in Caracas 72 hours to leave the country, further straining relations between the two countries. 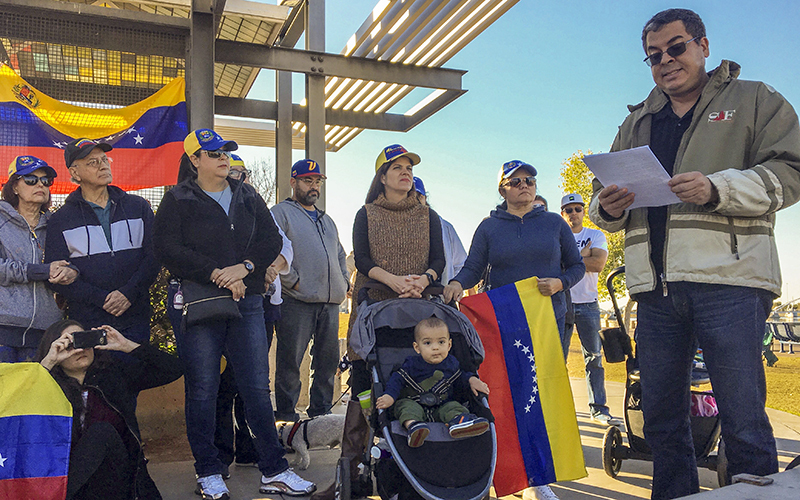 At the Tempe rally, the Venezuelan immigrants shared personal stories of their experiences in Venezuela and expressed overwhelming gratitude for Guaidó. Francisca Gim, a director of Casa Venezuela Arizona, said this has been a pivotal week, with Venezuelans hopeful for the future. “We are not people of killing each other. We are people of fighting for our democracy,” Gim said. Jose Ferrero, secretary of Casa Venezuela Arizona, said similar opposition movements have occurred in Venezuela before but failed in part because of a lack of international support. “They didn’t believe. Nobody believed us until now,” he said. Venezuela has been in a deep economic and political crisis for the past decade, facing food shortages, disease, and crippling inflation. Now, Ferrero said Venezuelans are not afraid. “They don’t care. They are willing to die. It’s crazy.” he said.